This is a stunning Fukuro Obi. A Fukuro Obi is generally patterned on one side and is usually worn for formal or informal occasions. 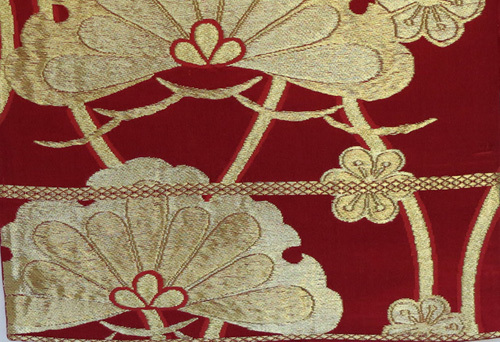 The unusual characteristic of this type of Obi is that it has an overall motif on one side, while the reverse side is more plain in terms of decoration, although equally exquisite in terms of the silk weaving. 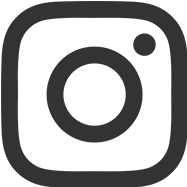 Often times, a portion of the design will appear on the plain side with a small plain portion appearing on the patterned side as if to allow the eye some respite. 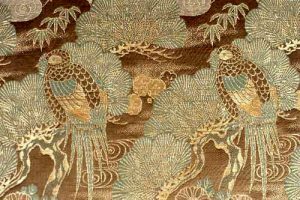 The more decorative side of this Obi is an intricately and brightly patterned tapestry in an increasingly popular and influential European style. The heavy use of woven gold threads adds an eye catching luster that creates a decorative statement in any room, for any occasion. The floral patterning is very stylistic and difficult to attribute to any known plant or flower. 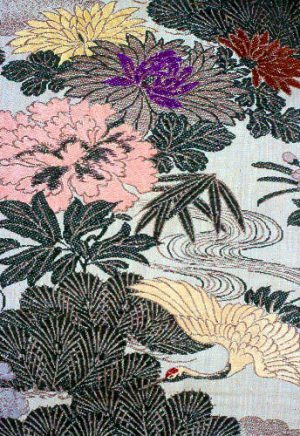 The dominance of the design is typical of the Taisho Era when it became popular to wear big, bold designs in bright colors. 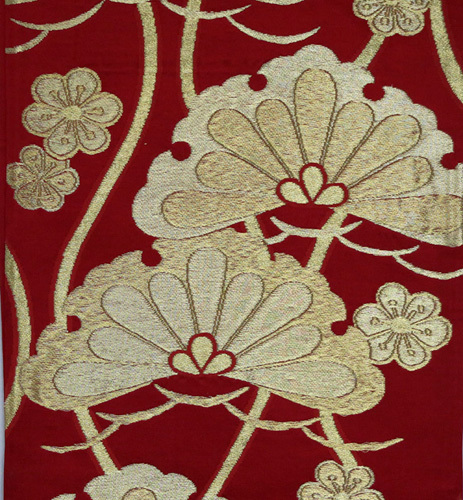 Red has long been a favored color in Japan, dating back for centuries. 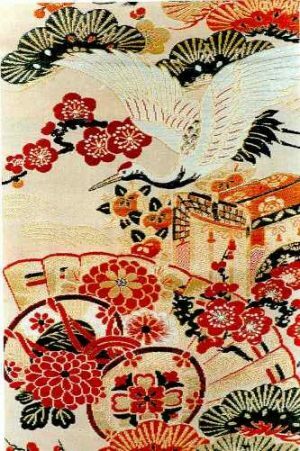 It was associated with sacred icons and, due to its initial rarity and expense, was limited to the upper classes until chemical dyes were introduced late in the Meiji Era. Gorgeous heavy Satin Silk in excellent condition. Creates an unusual and dramatic wall hanging, either vertically or horizontally, or extraordinary table or chest runner…especially stunning at the Holidays.